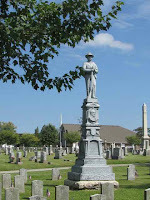 Cemetery wanderers throughout the U.S. and Canada can probably remember the first time they came across a white bronze monument. 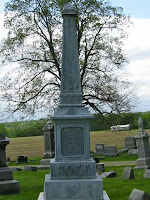 The oddness of the marker draws you in, fascinates you, and makes you want to learn more. 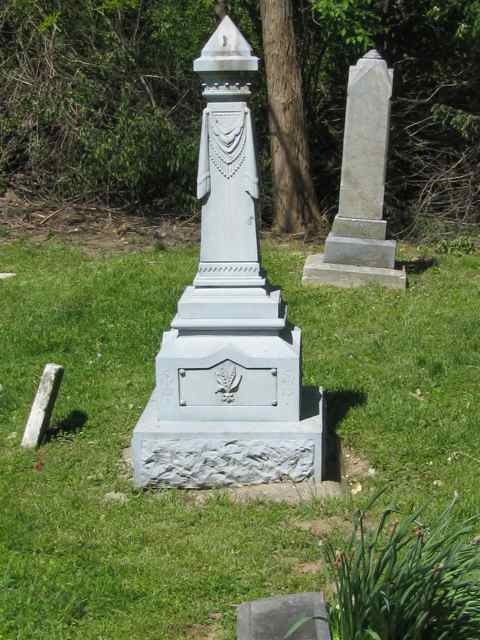 Although not white, and not made of bronze, these memorials are usually very detailed, always different, and found in very good to excellent condition. 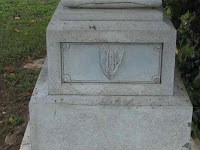 White bronze monuments are easy to spot once you start looking for their telltale bluish-grey color. 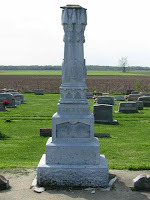 They come in many different sizes from small name ‘stones,’ to ornate 4-sided monuments, to statues. 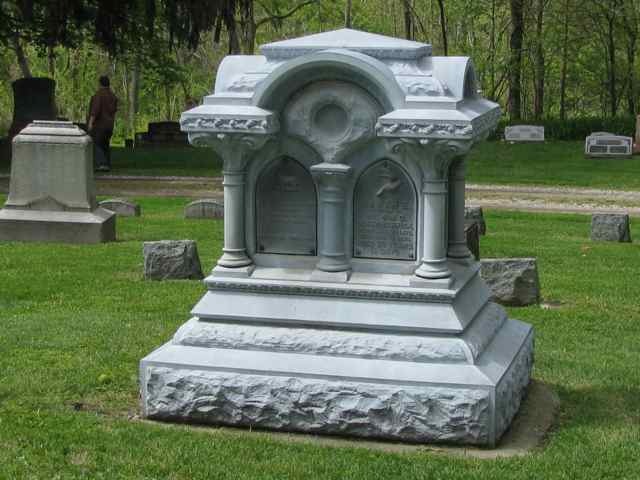 Even though they are constructed from metal, they are actually hollow! And interestingly enough, the same company manufactured every one of them. 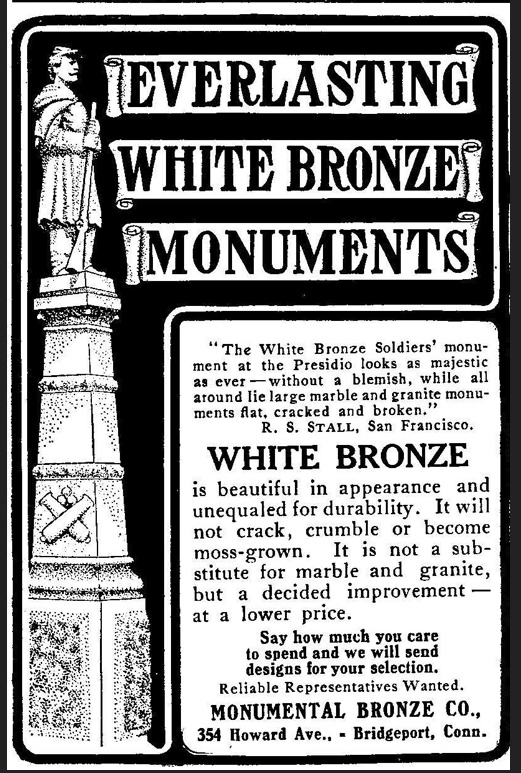 White bronze monuments were most popular during the 1880s to 1900, a time when many people considered granite and marble stones to be too expensive. 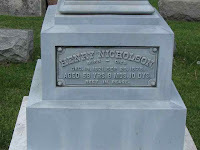 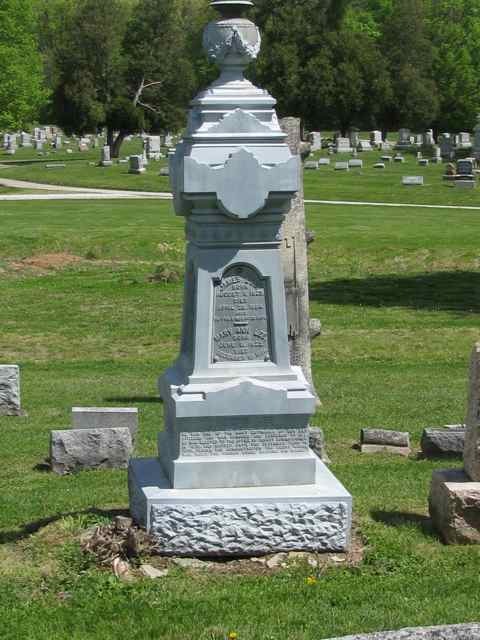 Zinc, which is the element that makes up 99% of a white bronze monument, offered a less expensive alternative for a custom designed and detailed grave ‘stone.’ But there were those who looked down on the white bronze marker as being a cheap imitation of a solid granite stone. 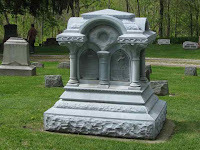 Some cemeteries even banned them, probably due to the urging of local granite and marble monument companies. 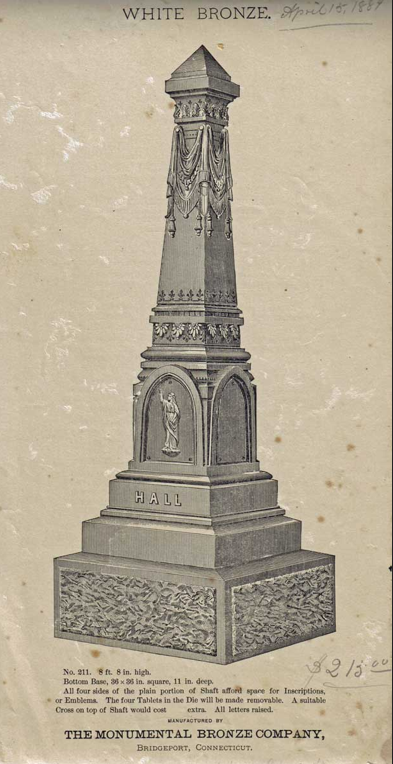 The technique for constructing these zinc monuments was developed in 1873 by M.A. Richardson of Chautauqua, New York. 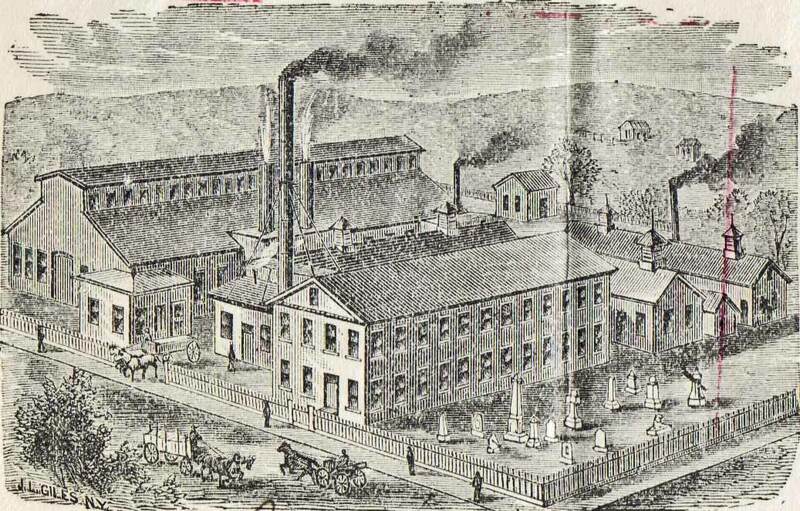 Richardson, along with two business partners tried to get a company off the ground but failed. In 1879, the rights were sold and a new company, the Monumental Bronze Company, was incorporated in Bridgeport, Connecticut. 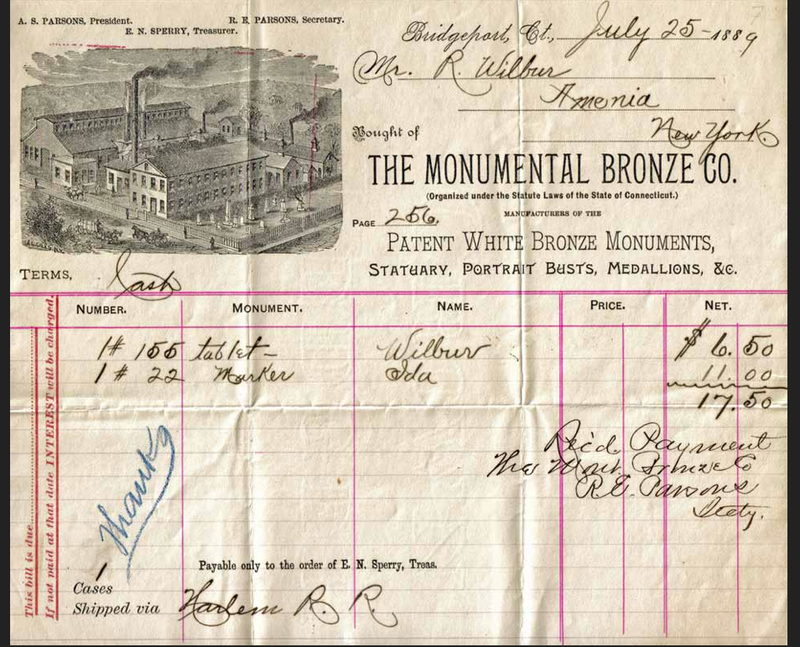 The original casting of the zinc monuments was done at the Bridgeport headquarters, while subsidiaries - the foundries and assembly plants, were located in Chicago, Des Moines, Detroit, Philadelphia, New Orleans, and St. Thomas, Canada. 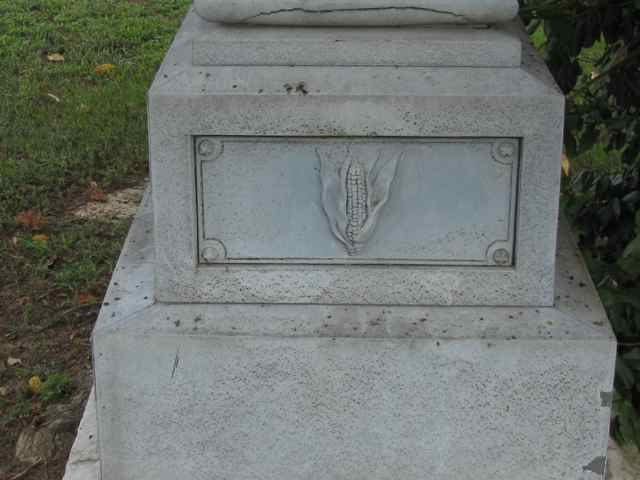 Each plant could place its name on the base of the monument to show where it had been assembled and shipped from. 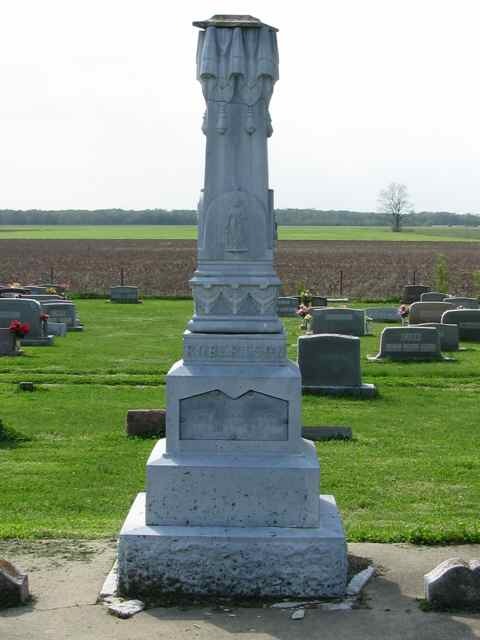 Monuments ranged in size from a few inches for name ‘stones’ to over 25 feet high with statues. 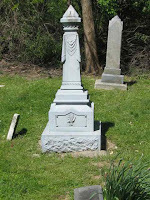 Every white bronze marker was made to order. 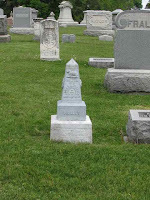 With over 500 monuments to choose from the possibilities were infinite. 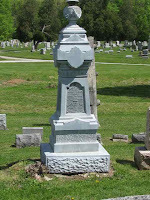 To begin, a base and monument shape would be chosen. 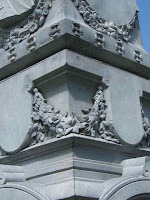 Then selected panels would be placed onto the monument with special screws. 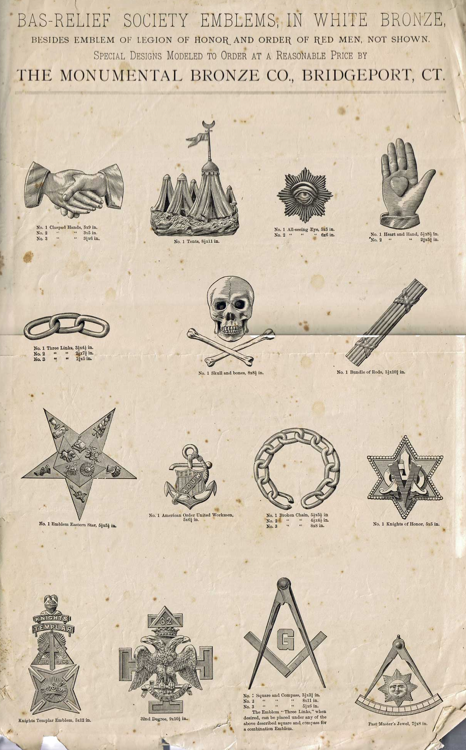 These panels included images of flowers, fraternal symbols, religious designs, and other Victorian motifs. Panels with the person’s name could be created, or relationship panels saying ‘Mother,’ ‘Father,’ ‘Baby,’ were available. 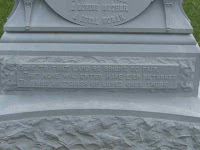 Epitaphs or religious verses could also be put on a panel. 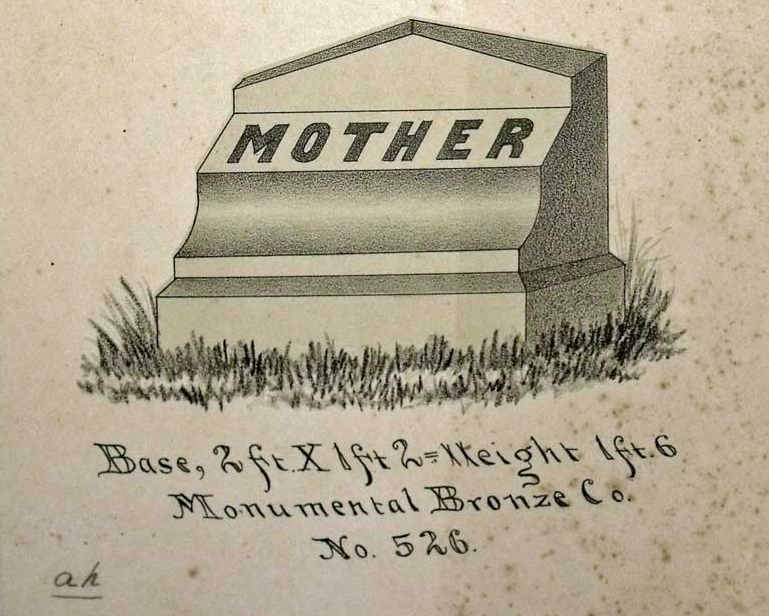 But white bronze markers were not just for individual or family graves. 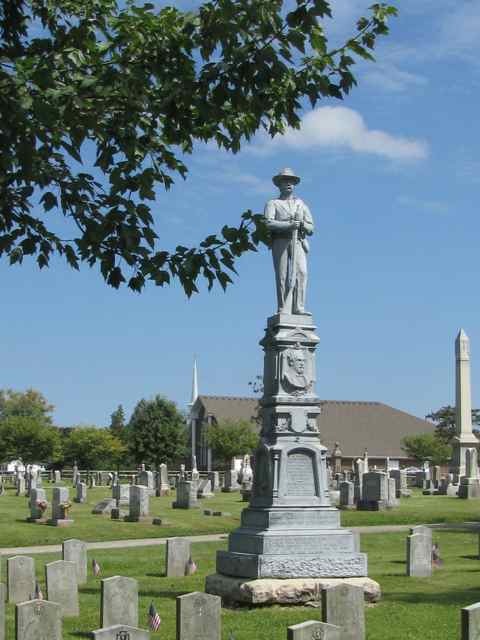 Towns in over thirty states across the U.S. purchased white bronze Union or Confederate soldiers to place in their veteran’s cemeteries or local parks to honor their war dead. Although white bronze monuments weathered well, they have one flaw known as ‘creep.’ This occurs when the weight of the top of the monument bears down onto the base and it begins to bow or bulge – very slowly, over the years. 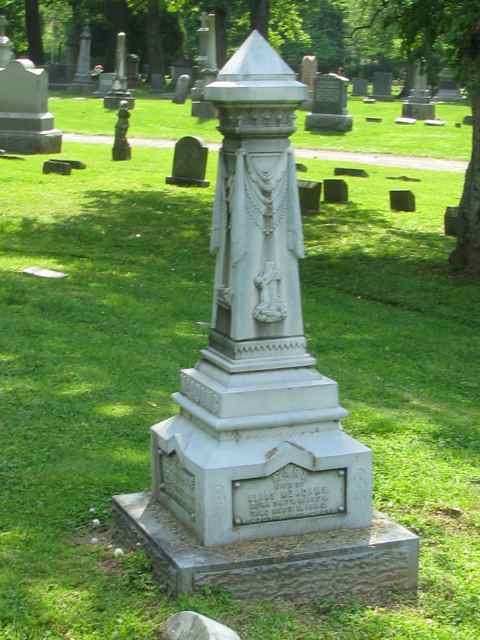 The only way to rectify this is to place a stainless steel armature inside the base to help support the upper weight. 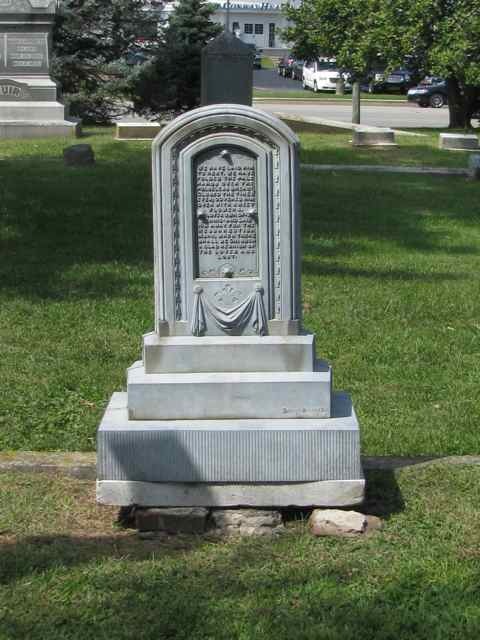 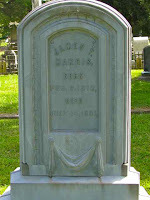 Unlike traditional gravestones and markers, there were not any stores where you could go to see or purchase a white bronze monument. 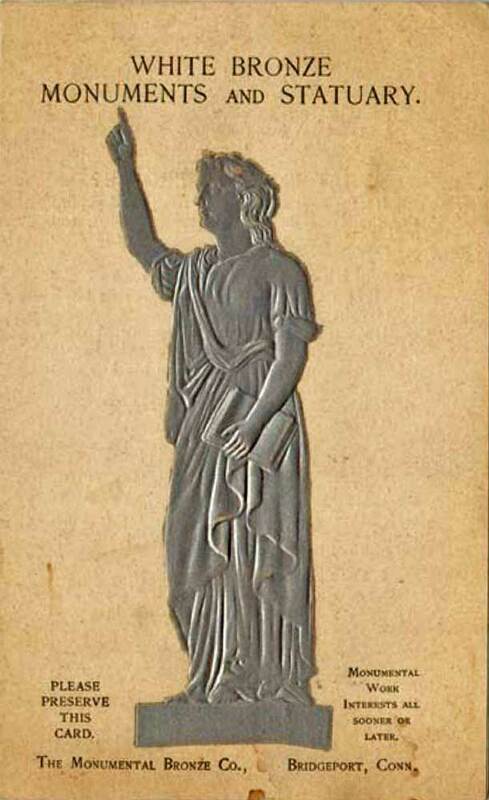 These zinc markers were sold only through company catalogs and in person by sales agents. 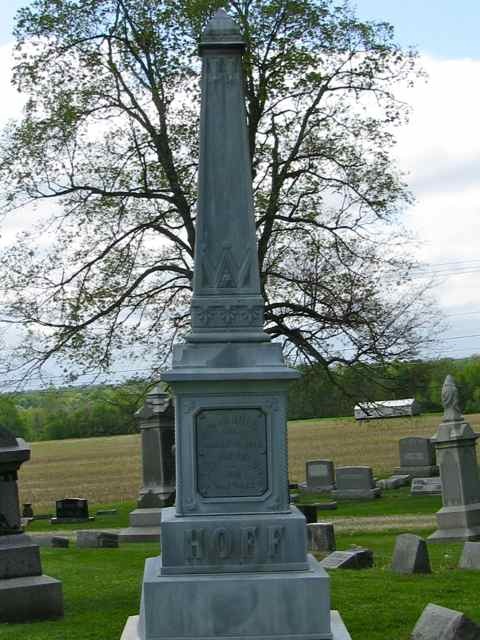 If you wanted to see a white bronze marker, you would have to go to the cemetery. 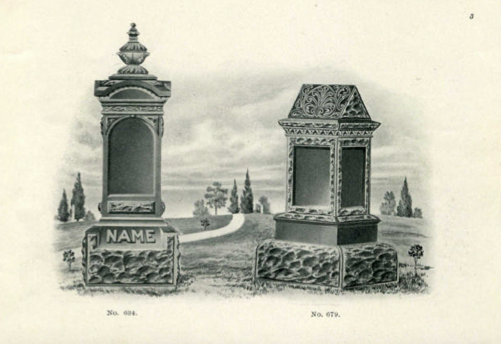 The sales agent would provide catalogs for the buyer to select the type of monument wanted, what designs were wanted on the panels, and names to be used. 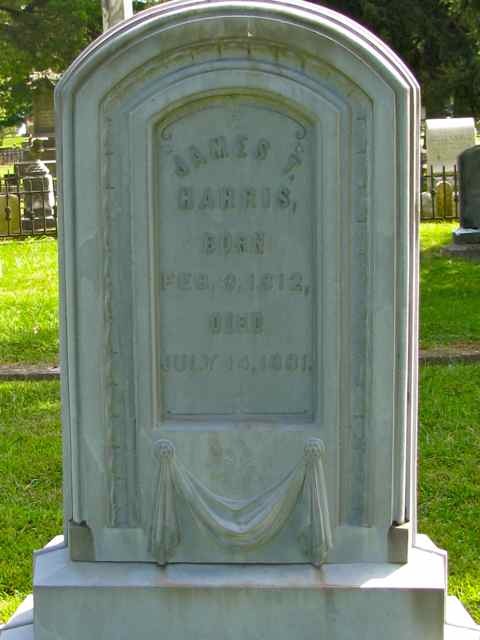 Prices ranged from $2 to $5,000. 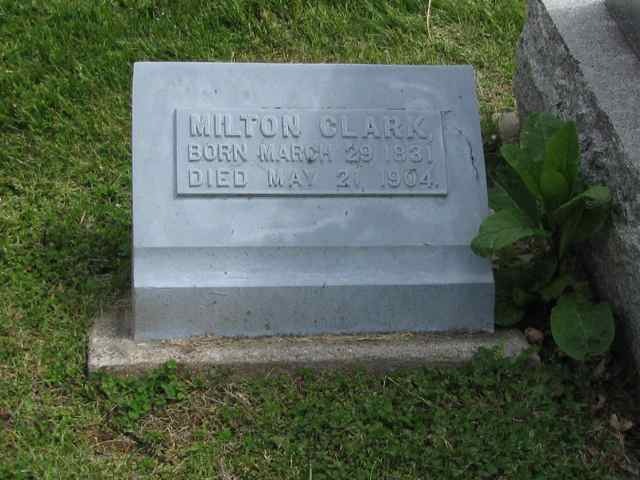 White bronze monuments were made for only forty years, from 1874 to 1914. 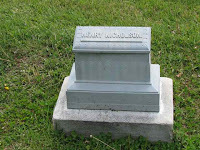 With the advent of World War One came their demise. 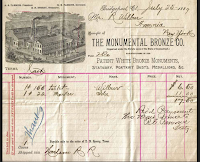 Zinc was needed for the war effort and the Monumental Bronze Company was taken over by the government to manufacture gun mounts and munitions. 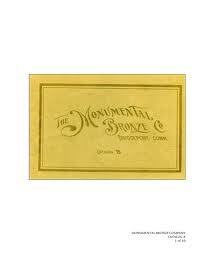 Although the company did continue to exist until 1939, they never produced another monument. 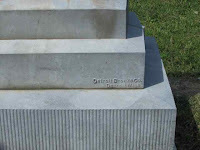 Instead, they tried to maintain the industry by crafting panels for existing monuments. The Monumental Bronze Company always claimed that the white bronze monuments were superior to granite and marble gravestones. And after 100 years, this claim has proven true. 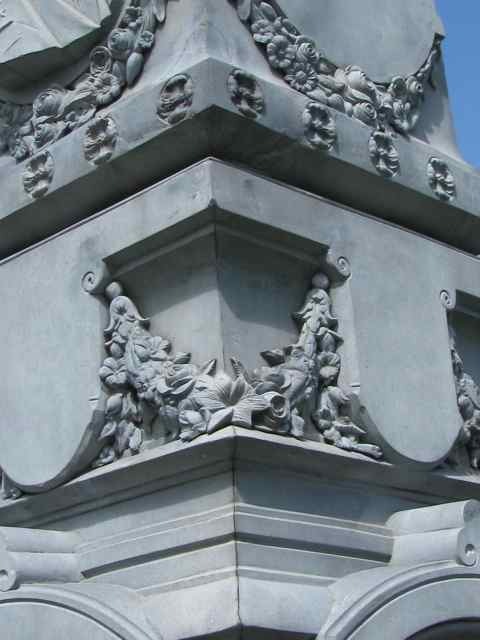 The outstanding quality and durability of the white bronze monument has indeed survived, and become even more popular, right into another century.